Posted on Wed, Mar 7, 2012 : 12:42 p.m.
Related story: Savoring spring-like temperatures: How long will this warm weather last? Step outside today and you will see the air seems to smell a little sweeter, the leaves seem a little brighter and the temperature feels unbelievably pleasant. Dare we say spring has arrived? How are you enjoying this breezy day? Help us document it by sending photos of your springy day to news@annarbor.com or by posting them to our Facebook wall. Then we'll compile a gallery of the springtime happenings in the area. 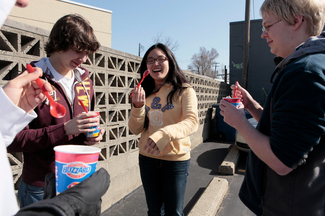 Hyunjae Kim, center, enjoys ice cream with friends Tuesday outside Dairy Queen on West Stadium Boulevard in Ann Arbor. Tuesday, we asked readers how they know spring is approaching and many responded with their their tried and true signs. "The sandhill cranes came back a couple of weeks ago, the redwing blackbirds and turkey vultures came back last week," said commenter JustCurious. "I have seen skunk cabbages emerging for weeks, the bulbs are coming up and the birds are signing their mating calls." Roger LaDronka also mentioned skunk cabbages and called he them "the first wildflower to bloom in Michigan." "I know spring is coming when the skunk cabbage pokes it's musky, hooded little flower head up out of the muck," he said. Spotting Mourning Cloak and Eastern Comma butterflies on a brisk walk is a sure sign for commenter MichaelinA2. The butterflies survive on rising tree sap rather than flowers. Some enjoy the re-emergence of patio dining at restaurants such as Dominick's and some watch for plant varieties, such as the fiddlehead fern, or listen for the song of the red-winged black bird. Dennis Hill said on Facebook that his sign of the upcoming spring is the sounds of the frogs on country roads. Others mentioned some of the more unsavory signs. "Discovering all the dog feces your neighbor's canines dropped in your backyard over the winter.....with your shoes," said commenter SmokeBlwr. Commenter Jcj added that the pending deadline of taxes reminds him that spring isn't far off, and commenter Shutthefrtdoor mentioned an increase of crime. Wed, Mar 7, 2012 : 6:12 p.m. If past experience holds, the warmth might make today &quot;summer dress day&quot; on campus. This happened spontaneously most years on the first warm day. Guys would quickly figure it out and there would be quite a few on the diag watching people go by.